All Sarah Colon wanted was to start her third year at the University of Puerto Rico Río Piedras campus. A month of protests paralyzed the institution and delayed the start of the fall semester. Then, the day the campus reopened, she received a message that the university would be closed for the rest of the week. Hurricane Irma was moving dangerously close to the island. Two weeks passed before the campus opened again with minimal damage. Colon started classes again – but only for two days. Hurricane Maria was rapidly intensifying into a Category 5. The eye of the storm was projected to pass straight over Puerto Rico. This time, she could not return to campus. The hurricane devastated the Río Piedras campus. Five days later, she was on a plane heading to Miami. Today, she is one of the first students from Puerto Rico and other hurricane-battered Caribbean islands to resume their education at FIU. 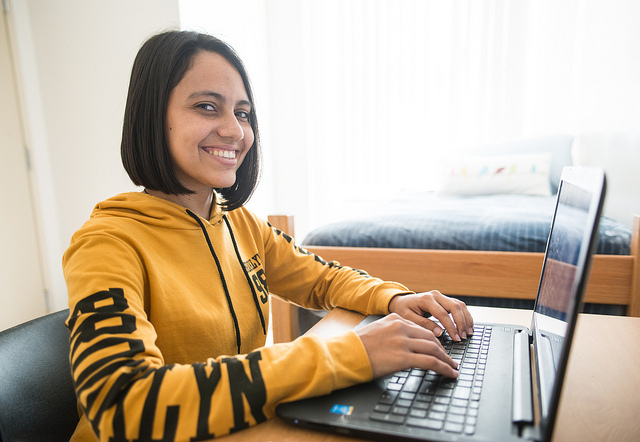 She started ENC 1101: Writing and Rhetoric on Oct. 16, the beginning of the October term – an eight-week mini session available to all FIU students. FIU is also her new home. Less than two weeks after her horrifying experience in Puerto Rico, Colon neatly unpacked her two pair of pants, ten tops, and four pair of shoes placing them in the narrow closet of her new home – a room at Lakeview North. This was all she could carry with her when she fled Puerto Rico. Of her few belongings, the most valuable: a small gold coin hanging on a black string, a necklace her sister gave her before her trip to Miami. More than 600 students from islands devastated by hurricanes Irma and Maria that have applied to be visiting students at FIU under the #FIUstrong initiative, which offers them an out-of-state tuition waiver through the spring of 2018. The John S. and James L. Knight Foundation also has awarded FIU a $350,000 grant to support Puerto Rican students affected by Hurricane Maria. The grant will fund living expenses, tuition, and other costs associated with relocation. In addition, the funds may support efforts FIU may undertake in Puerto Rico to assist universities that suffered storm damage. Like Colon, many of the students arrived in South Florida with very limited resources and are in need of housing and other essentials. To help meet their needs, the FIU Foundation has established the Disaster Response and Recovery Fund. One hundred percent of the money raised through the fund will go to helping those impacted. “This is my home for now and I feel really lucky that I have a place to stay and that I’m able to start school again,” Colon said. Thank you to FIU for that initiative.